From Paths of Sunshine Cookbook, Chuck Roast Buffalo Style looks pretty simple. It uses chuck roast which is relatively inexpensive and uses ingredients you probably have in your pantry. Our Plains, Georgia, friends published Plains Pot Pourri, and we use their recipes quite often here in Kitchen Kapers. This recipe from Mrs. Dewey Stone is chicken and biscuits with peaches on the side. Thank you, Ma’am. Treasures and Pleasures was published many years ago by the 1990 Presbyterian Women of First Presbyterian Church of Apopka. We thank Shirley Patterson who has shared her recipe for Southern Fried Fish. Sara Astarit’s Baked Sliced Potatoes recipe looks delicious. We appreciate her sharing through Preserving the Big Potato published by the Apopka Historical Society. Our co-worker, Anita Dyer, brought Mexican Rollups for one of our celebrations here at work. After our “oohs” and “aahs,” we were able to get the recipe from her. She found it online at www.tastesoflizzyt.com, who was kind enough to simply want credit where credit is due. It seems to be a pretty simple chore of getting the rollups done in advance and refrigerating prior to your event. Anita kept the layers separated with waxed paper or plastic wrap in a sealed container and easily transported them from home. From The New York Times NEW Natural Foods Cookbook, by Jean Hewitt, we have Make-Ahead Bran Muffins. You stir up the batter, store it in the refrigerator, and bake however many freshly-baked bran muffins you want for your breakfast! The batter keeps for about two weeks in the refrigerator. We have Lillian Carter’s Peanut Brittle from Plains Pot Pourri. Miz Lillian is the mother of our former president Jimmy Carter. We thank the Plains, Georgia, community for sharing their lovely book of recipes. Place chuck roast in covered roasting pan. Combine catsup, beer and brown sugar. Blend thoroughly. Pour combined ingredients over beef. Cover and bake at 350 degrees for 3 hours. Garnish with fresh spinach leaves and parslied potatoes. Serves 6. Dip cut-up chicken in evaporated milk. Roll in flour mixture. Set remaining flour mixture aside for gravy. Melt 1/2 cup shortening in 9- x 13-inch pan, add chicken, skin side down, basting occasionally. Bake uncovered in hot oven (425-degrees) until tender. Average cooking time is 40 to 50 minutes. Turn chicken, moving to one end of pan with spoon or rubber scraper. Push drippings to end of pan with chicken. Arrange drained peach halves (No. 2-1/2 size can) on chicken. Open can of biscuits, separated, (or make your own) and put on other end of pan. Bake 15 minutes or until biscuits are brown. Remove peaches, chicken and biscuits to hot plates. Mix dry ingredients together in a paper bag; place fish in bag and shake to coat with mixture. Place fish in skillet with hot vegetable oil and fry 7 to 12 minutes or until golden brown and flaky. Preheat oven to 425 degrees. Slice cleaned whole potatoes partially, using wooden spoon as a guide to not slicing completely through potato. Melt butter, adding parsley, thyme, sage, allspice, salt and pepper. Fan the potatoes open as much as possible and place in a large casserole dish. Pour butter mixture over potatoes, covering as much of each slice as possible. Sprinkle cheese over potatoes and bake for 50 minutes or until soft. Serve hot. 1. Blend together sour cream and cream cheese with mixer. Stir in chilies, olives, cheese and seasonings. 2. Spread the mixture equally on each of the floured tortillas and roll them up tightly. 3. 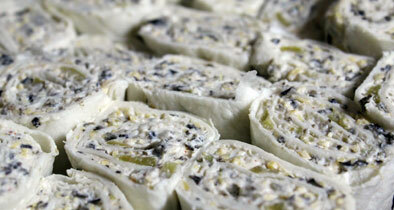 Wrap each rollup in plastic wrap and refrigerate overnight or for at least two hours. 4. Slice and serve with salsa. 1. Mix together the flour, cereals, wheat germ, baking soda, salt, and sugar and set aside. 2. Beat the eggs, oil, and molasses together. Add with the buttermilk to dry ingredients, mixing only until the ingredients are moistened. 3. Store covered in refrigerator until ready to use. 4. When ready to bake, preheat the oven to 375 degrees. 5. Stir the batter and spoon into oiled muffin tins, filling two-thirds full. 6. Bake for 20 minutes or until well browned. Cool on a wire rack. Yield: About two dozen 2-3/4 inch muffins. Note: Recipe can be doubled if you wish. Batter keeps for about two weeks. Boil sugar, water and Karo syrup until mixture spins a thread. Add peanuts. After adding peanuts, stir constantly until syrup turns golden brown. Remove from heat. Add remaining ingredients. Stir until butter melts. Pour up quickly on two cookie sheets with sides. As mixture begins to harden around edges, pull and spread toward sides until then.